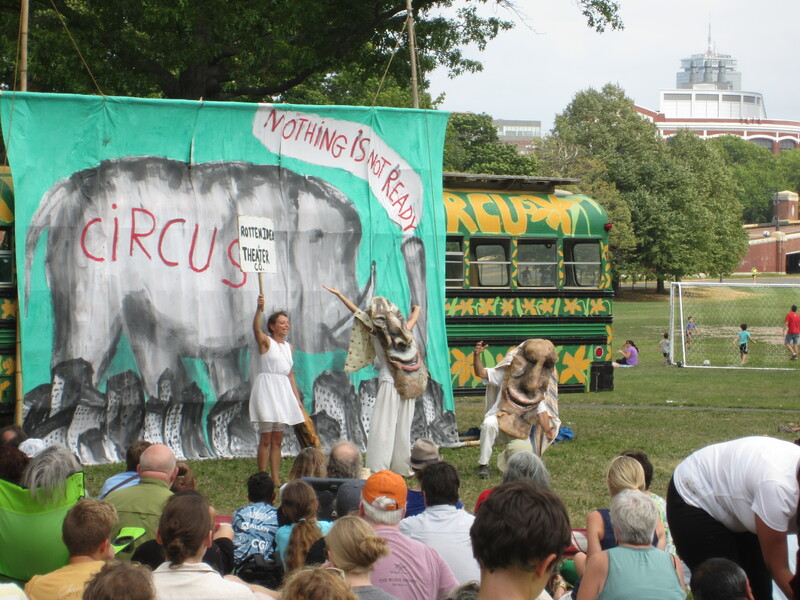 The award-winning Vermont-based Bread & Puppet Theater will bring their new The Overtakelessness Circus to Magazine Beach Sunday, September 6th, at 3pm. FREE! Cross over to the park on the pedestrian footbridge, at the foot of Magazine Street and Memorial Drive. Rain location: The Morse School at 40 Granite Street. Background : Now in its 52nd year, the Bread & Puppet Theater is one of the oldest and most unique self-sustaining nonprofit theater companies in the United States. The theater champions a visually rich slapstick style of street-theater that is filled with huge puppets made of paper maché and cardboard, combined with masked characters, improvisational dance movement, political commentary, and a lively brass band. The company’s performances are described by The New York Times as “a spectacle for the heart and soul.” For further information, click here. This event is brought to you by the CNA and Cambridge Arts. Outside of our upcoming benefit Sunday, Oct. 4th at the Riverside Boat Club, this will mark the close of our 2015 season. Thank you, sponsors! Sanofi, Forest City, MIT, the Charles River Conservancy and Knucklebones. ← The Pool is CLOSED. Bread & Puppet is coming. And more….